ASUS: Hey Guys, Forget You Ever Saw That Android Netbook, OK? One of the early surprises of Computex was this delightful little Android netbook from ASUS, based on the ultra-efficient Snapdragon platform. 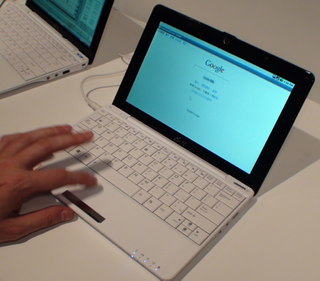 Acer has since responded with a full-throated commitment to Android netbooks, but now ASUS is backing off. Frankly speaking, the first question, I would like to apologize that, if you look at Asus booth we've decided not to display this product... I think you may have seen the devices on Qualcomm's booth but actually, I think this is a company decision so far we would not like to show this device. That's what I can tell you so far. I would like to apologize for that. For the time being this project is not a priority because our engineering resources are limited.